Letter to the Scottish National Portrait Gallery, June 2016 – BP or not BP? Thank you for acknowledging our letter of 18th April 2016. We are grateful for your response. However, we are not confident that you have fully understood our concerns regarding BP sponsorship and in particular, the Scottish National Portrait Gallery agreeing to host the National Portrait Gallery Annual Portrait Awards as sponsored by BP. We are therefore seeking further information on a number of points. Firstly, we want to clarify that we as an organisation are entirely supportive of the Portrait Awards themselves. Our position is clear, that the artwork artists create for this important prize would be better served by a more respectable sponsor. We do not in any way want to spoil your pride and pleasure working with colleagues in London. We simply find it incredible that a gallery in the 21st Century cannot take equal pride in standing for the protection of the environment, the reputations of all those associated with these awards and the Museums Association Code of Ethics. We note that one member of your board, Tari Lang, will be acutely aware of the reputational damage BP does to the institutions it associates with, following her witnessing the EIF rejection of BP sponsorship. We also note that another, Willie Watt, has interests in the oil and gas industry. Mr Baker, you will be in attendance at the opening event of the BP Portrait Awards 2016 in London and we hope there, that you will be able to share our signatories’ position. We do respect your point and you are entirely right when you say “that not everyone will be supportive of an association between the Galleries and the oil industry”. We would hope that your Board Members would collectively consider this and the greater good, rather than succumb to pervasive and manipulative market forces, particularly in the light of the Museums Association being bold enough to formally investigate Art not Oil’s findings as published in their report 3rd May, entitled “BP’s cultural sponsorship: A corrupting influence” . We enclose one printed copy for you and your Trustees. This report exposes the multiple ways BP has interfered in the museums and galleries it sponsors, from curatorial decision-making to security procedures. Secondly, we refer you to the article in the Guardian of 29th April 2016, “Museums face ethics investigation over influence of sponsor BP” , in which the Scottish National Portrait Gallery and the Scottish National Galleries feature, regarding internal documents showing your institutions accommodating BP’s demands. Alistair Brown, policy officer at the Museums Association, states that the MA’s “code of ethics encouraged museums to act transparently and to only seek support from organisations whose values were consistent with their own”. It is shameful that a leading cultural institution, which should represent a society concerned for the welfare of its people and their environment, should continue to deem this sponsorship acceptable. 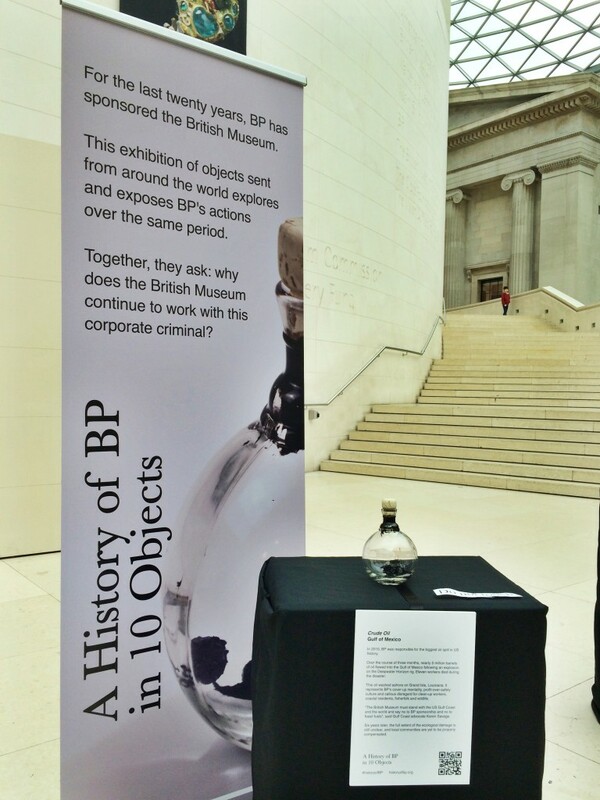 The conditions for BP’s sponsorship of Sunken Cities appear similar to those of the British Museum’s exhibitions last year on Mexico and Australia, with associated events affording opportunities for BP representatives to gain intimate access to government officials from countries in which BP has live oil interests and controversial recent histories. This emerging pattern raises questions in the arts community about the ethics of oil sponsorship, which seems able to do more than just buy oil companies social license to operate by association with respected institutions deemed to work in the public interest. The inference increasingly made by critics of oil sponsorship is that, in accepting funding from BP and other oil majors, museums in fact assist those companies in furthering drilling projects around the world. Access to Minutes of the meeting you refer to in your letter dated 29th April, with the Board of Trustees. Access to all correspondence between the Scottish National Portrait Gallery and BP within last six months. Information regarding meetings and correspondence between BP’s PR and SNPG/ NG’s Press and PR in relation to Portrait Awards. The date of your next board meeting and whether you would extend an invitation to our members. We remain hopeful that you will consider talking with us about the reasons for preserving this unnecessary association between the oil industry and the art you promote, protect and conserve within our galleries.